Food Adventures of a Comfort Cook: Eating Art, even if it is Simply Silly. Eating Art, even if it is Simply Silly. 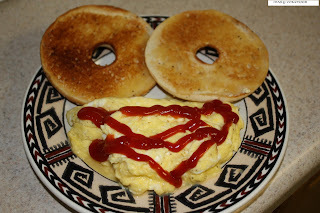 To me, it looked like the funniest face I have ever seen on a breakfast plate; I couldn't help but laugh at it. I had to grab the camera and take a photo and name it the "Goofy Eyed Breakfast". It tasted the same as usual, and yet I seemed to enjoy it more because of the fun of it. 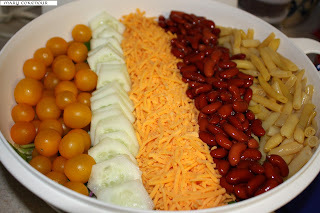 Then I remembered a photo I had taken awhile back of a salad I had made. It was my team's turn to make a meal for our monthly meetings and I chose to do the salad. I asked if I should bring things separately, so everyone could make their's own up, but was told no, just mix it all together. I considered what items I knew most of my coworkers enjoyed and what was very disliked. However, as I mulled it over I knew I just couldn't throw it all into a large bowl and produce chaos. What I presented was, as quoted by some of the ladies, "too pretty to eat", but eat they did and it was very much enjoyed. There was an assortment of salad dressings and once we finally dug into the salad; well it was quite delicious and satisfying to all. Eating should satisfy the senses, not just the gnawing of the stomach. 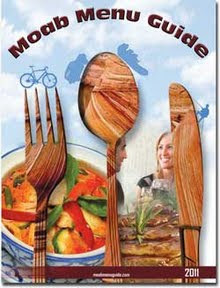 So give your eyes a sight and create artwork with your food.